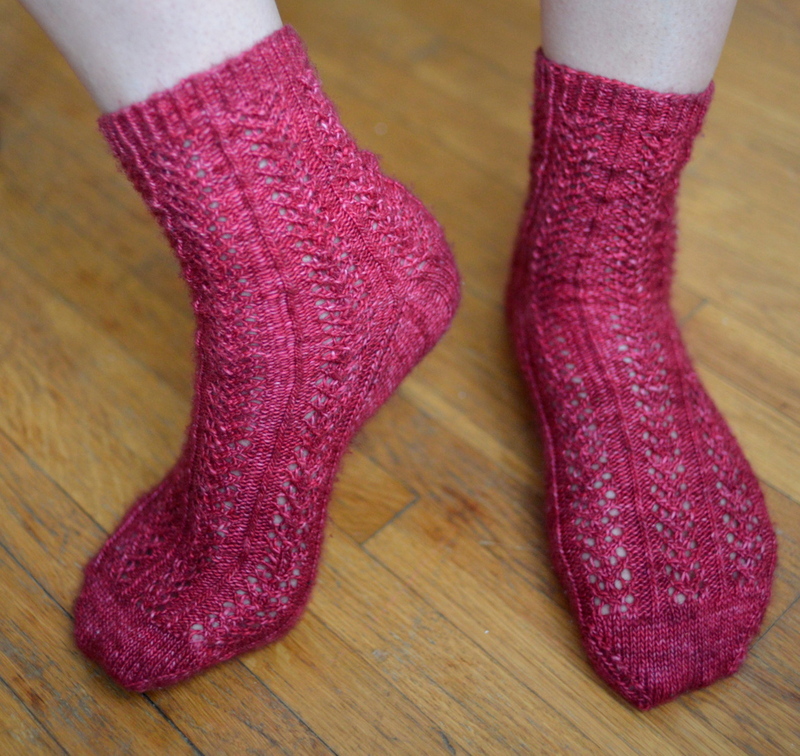 I just finished these socks in my favourite basic sock pattern, gusset heel basic socks by Wendy Johnson. 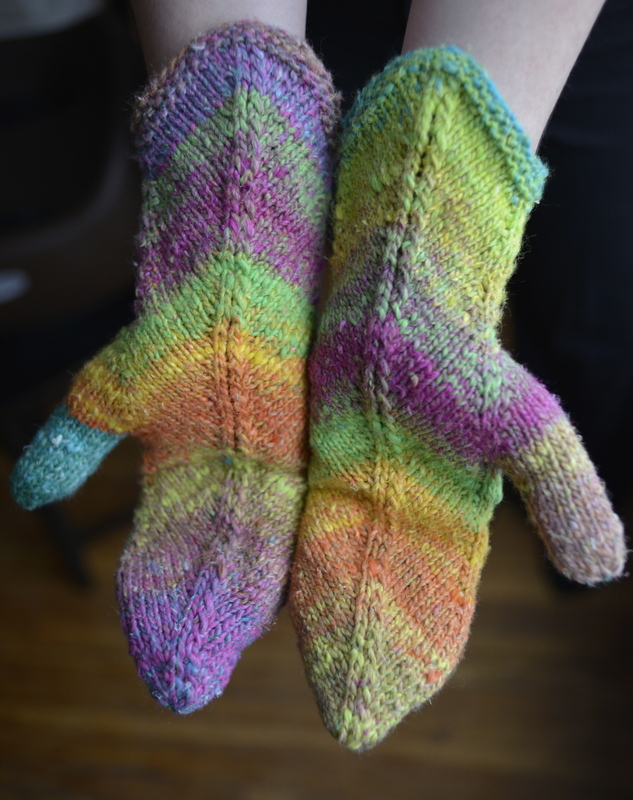 They were made from impulsively purchased Studioloo Bootsie (yarn spun and dyed by a local artist) in elephantgirl. I loved watching the colours materialize, although I did hope they would pool a little more organically. Admittedly, the stockinette got a little tedious, but I’m a dedicated sock knitter. There’s something very satisfying about wearing a handmade pair, especially in this unseasonably cold and wet weather. Whenever I drop in to a yarn store without a specific project in mind, I’m inevitably drawn to yarn like this; there’s something irresistible about the skeins of soft, gorgeous, striped, multi-coloured sock yarn. Nearly every impulse purchase in my stash is a single skein of sock yarn in several saturated hues. The problem (other than the obvious cost): what to do with them? When I buy them, I tell myself I will find a choose a challenging new sock pattern, but in reality, most textures look muddy in multi-coloured yarn. There are some rare exceptions, like Cookie A’s fab wedge socks, but there’s only so many pairs of those I can make. And so I have a number of flat socks and an even larger number of gorgeous, unused stashed skeins. What are your favourite patterns for multi-coloured sock yarn? I’d love to hear your suggestions for this part of my stash! 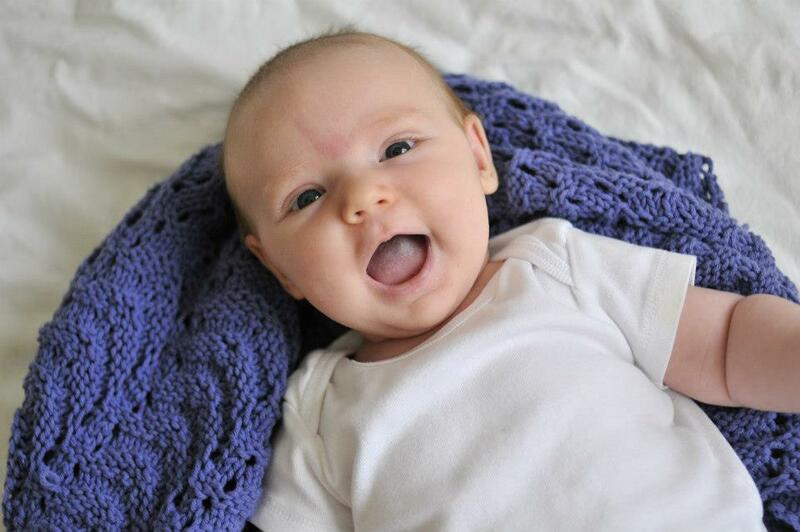 This entry was posted in Knitting, Socks, Yarn and tagged Cookie A, knit, knit. sock. 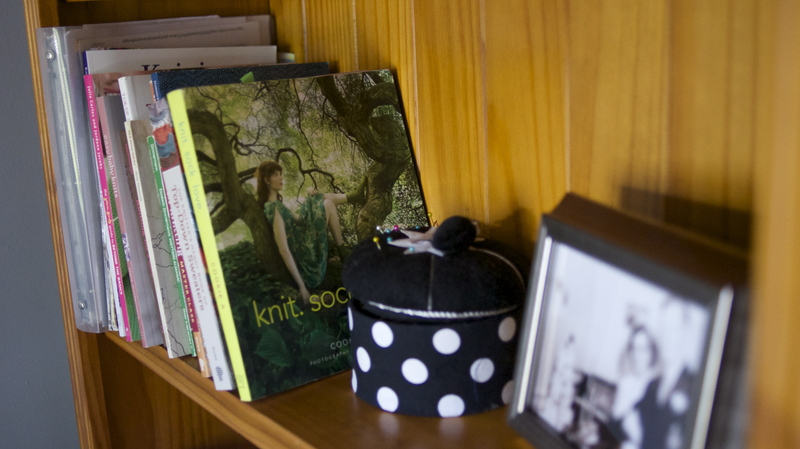 love., stashed yarn, Studioloo, toe-up, wedge socks, Wendy Johnson on March 28, 2013 by lisagono. Happy Valentine’s Day to … Me! This year, I’m stuck working late on Valentine’s Day (which is also my birthday! ), so I decided to treat myself to a little gift: these holiday coloured-pink socks (Hederas free on Knitty and in Knit. Sock. Love). Like many knitters, I often get caught up in working through a long list of Christmas and shower gifts and toddler sized sweaters are so fast and satisfying, I haven’t knit a sweater for myself in almost two years. When the last socks I knit for myself wore through earlier this month, I realized it was time to make something just for me. So when I noticed the Knit. Sock. Love. knit-along on ravelry, I decided it was a perfect oppurtunity indulge. I love how soft and cozy the madelinetosh merino is, even in this pretty, simple lace. I’m happy that they’ll be keeping me warm at work tonight. And don’t worry, I have a little something for my long-suffering husband too, I just didn’t knit it this year. This entry was posted in Knitting, Socks and tagged Cookie A, cuff down, gifts, knit, knit. sock. love., lace, madelinetosh, Valentine's on February 14, 2013 by lisagono. My third pair of holiday socks are done! It is now looking increasingly likely that I will not finish the remaining three pairs before Christmas (and I may, gulp, have to brave the mall at the last minute), but I will perservere. Overall, these socks (Wedge socks from knit. sock. love.) are clever and I love the way the short rows look in multi colour yarn like this. 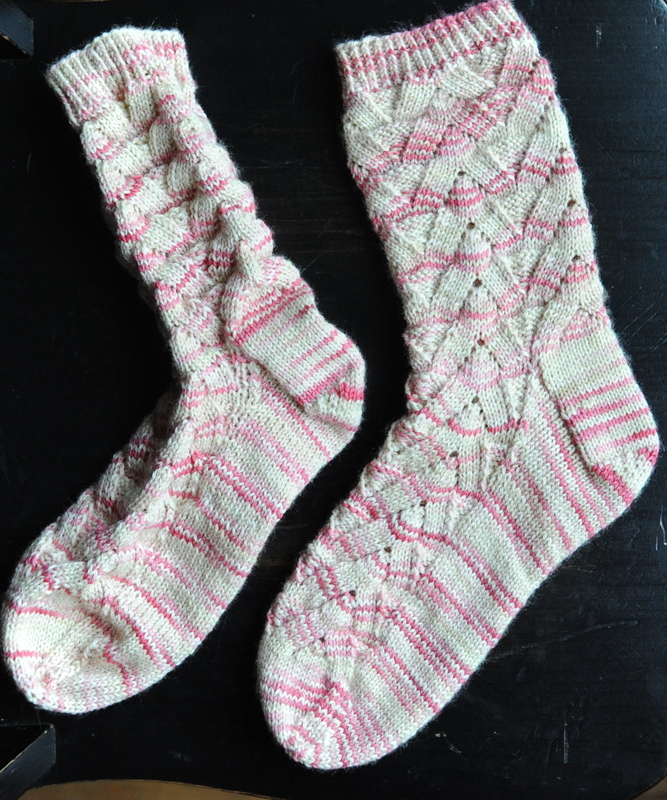 The socks are worked in a series of short row (back and forth) wedges that give it the garter stitch sections. The beginning of the row is rotated 180 degrees each time you repeat, so that the thin and thick ends of the wedges alternate. I have no idea how Cookie A conceives of inventive ideas like this, but I really like it! It’s hard to find a pattern that works well for multicolour yarn, or one that is as co-ed as this one is. 1. The garter stitch wedges are really stretchy. I made these in medium and I’m a tight knitter, and they are easily the biggest socks I’ve ever made. Make them at least 1 size smaller than you think you need. 2. When I got to the first toe, I was convinced that I had made a mistake, since the pattern made it seem as though the toe short rows should be worked off-center. I checked ravelry and googled errata, and there is no mention of a typo or mistake in this pattern, so I will assume the mistake was mine. I’m still not sure if the toe short rows are intentionally off-center here or if I made a mistake when rotating the rows (you mark a new beginning of the round at least 8 times in this pattern, so if you make one mistake, it will be translated all the way down). Rather than make myself crazy searching for the source of the problem, I just lined the short rows up with sides of the toe (working the toe across the sole stitches) and they look great. On the second socks, I was much more careful with couting the rotations, but still had the same problem. 3. They absolutely, positively must be blocked. They’re an absolute collapsing mess when they come off your needles. This entry was posted in Knitting, Socks and tagged blocking, Cookie A, gifts, knit. sock. love., ONline Supersocke, socks, wedge socks on December 7, 2012 by lisagono. 1. Of all the socks in knit. sock. love., they seemed the most approachable, and I’ve been anticipating actually using this book for months. 2. They are wildly popular (with over 16000 projects on Ravelry), and I presumed that that many people can’t be wrong. 3. They’re lacey enough to be pretty, but solid enough to be warm. While I’m pretty happy with the results, I’m a little underwhelmed; their enormous popularity and the overall beauty of knit. sock. love. set my expectations very, very high. They’re cute, but they’re not spectacular. To be fair, that may also have to do with the disappointing way that the colour was distributed in stripes in this yarn. They were also socks wildly in need of blocking, which launched me on a new adventure. I’m usually pretty lazy when it comes to details, so I tend to do as little blocking as possible. It isn’t essential for everything. Many objects come off your needles looking great, but in general the more complicated the texture, the more you need to block (this is especially true for lace). Blocking can give your knit objects shape, and can even rescue the odd stretched out or otherwise misshappen sweater (even if you picked it up at the mall). Basically, you wet the knit garment and carefully stretch it into shape, leaving it that way to dry. Previously, I have just dampened my socks and pinned them down, but these socks clearly demanded more discipline. I looked online for sock blockers, but found this set of DIY instruction instead. 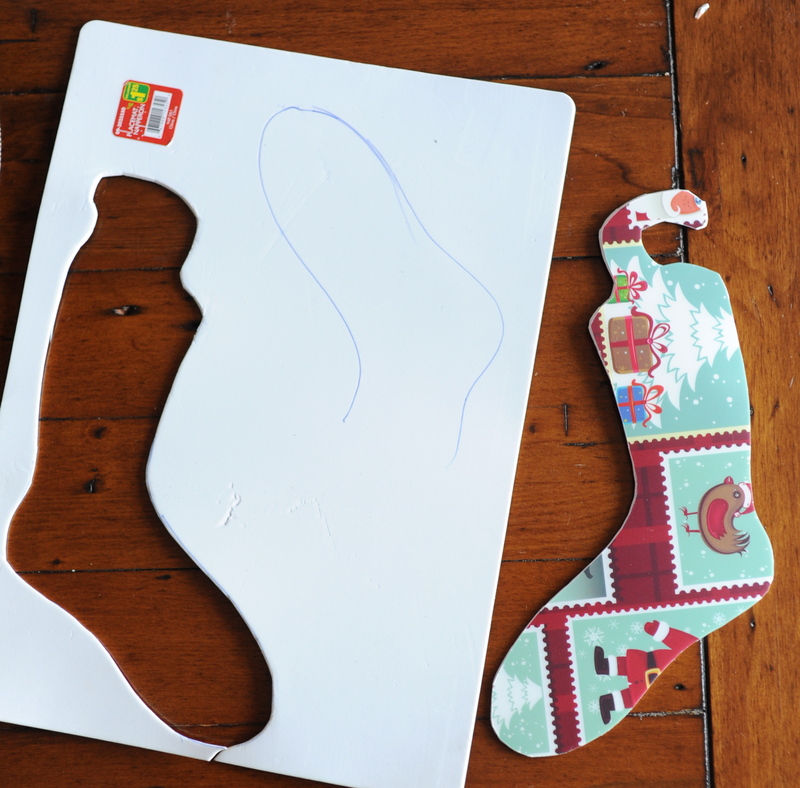 The suggestion to use a placemat was ingenious. After a quick trip to the dollar store, I had these. I traced the wooden sock holders at my local yarn store, and added a hook at the top, so that my socks could hang from the shower curtain rod as they dry. Success! This entry was posted in Knitting, Socks and tagged blocking, Cookie A, cuff down, gifts, knit, lace, madelinetosh, socks on November 21, 2012 by lisagono.